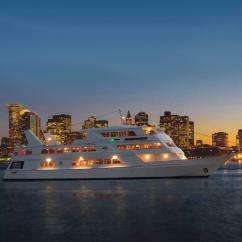 Eat, drink and be merry aboard unforgettable Boston dinner cruises and lunch outings! Boston is a premier spot in the U.S. for fine wining and dining. 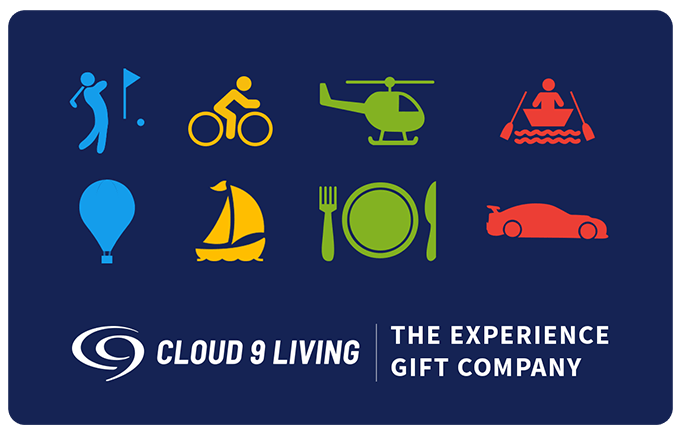 So for any special occasion or even "just because" — check out Cloud 9 Living's collection of Boston cruises, for unique ways to experience the waterfront and beyond. 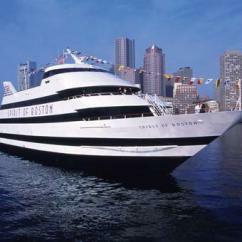 Toast to the start of a brand new week in style, aboard a brunch Boston harbor cruise. With a delicious gourmet buffet right at your fingertips, and stunning views of the city readily available, Sunday is guaranteed to be sensational! Keep the good times flowing with mimosas and other favorite brunch beverages, by visiting the ship's fully stocked cash bars as you cruise the harbor. 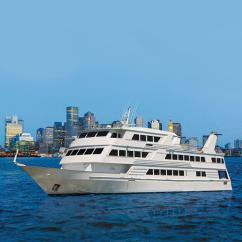 Take in Beantown's magnificent afternoon views from the comfort of a luxury yacht on the Boston Harbor Lunch Cruise. The ship comes loaded with not only a mouth-watering buffet meal, but also entertaining amenities like a DJ, dancing, games on the outdoor decks, and a photo booth. Care to kick things up a notch? Upgrade to the gourmet lunch option, featuring many of the same perks aboard the ship, with the bonus of an elegantly-plated meal. Perhaps you prefer an evening outing? 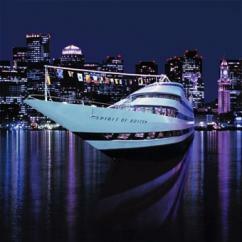 Boston dinner cruises come with a variety of enticing options from which to choose! Go for a gourmet dinner cruise in Boston that comes with plated courses, or opt to delight in the impressive spread of the ship's grand buffet — all while indulging in many of the same sightseeing and entertainment benefits offered on the lunchtime harbor cruises. And if you'd like to swap a luxury yacht for some tall ship sailing, then Boston's Lobster Dinner Cruise certainly must not to be missed! Savor some east coast specialties as clam chowder and a 1.25-pound lobster fill your plate. 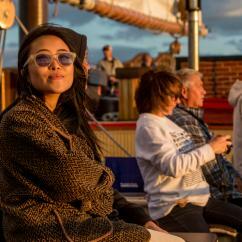 Enjoy desserts and stunning scenery as this Boston Harbor sunset cruise glides past famous landmarks like Fort Trumbull, Fort Griswold, lighthouses, and more. Kick back to relax, or try your hand at taking the wheel of the mighty Mystic Whaler.